The wild strawberry is to be found on hillsides, in woodlands, and on exposed land throughout most of the British Isles. It's not uncommon to find either wild specimens or garden escapees, and as you can see from this picture it can fruit quite profusely. Many texts reccomend that the wild strawberry ripens in August, but depending on how much sunlight the plants get they can be ripe from June onwards. Use it like you would a domestic strawberry, bearing in mind that the flavour is more intense and sweeter in the true wild strawberry. 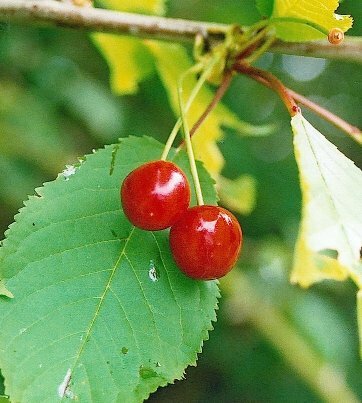 The wild cherry or gean is common right across europe. All of the cultivated cherries are derived from this tree, so as you might expect there's a huge amount of variation between the fruit. They can be anything from harsh, acidic, almost inedible little lumps to beautiful, succulent and sweet. You can only really tell by tasting them, but if you find a tree that gives you fruit you like then you can visit it year after year. The fruit are ready around June, but be quick about picking them or the birsd will beat you to them. A good way to use an excess of wild cherries is to make cherry brandy. 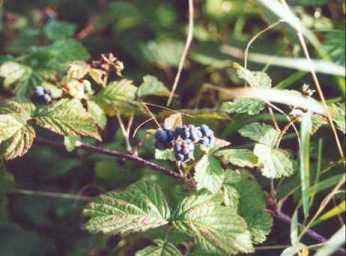 The blackberry is perhaps the most common, widespread wild fruit that there is in the UK. Best picked early in the year (these are rather late ones), the early ones are juicier. Bushes in the sunlight will start having ripe berries as early as late June or early July, but the crop can continue until the frosts. Great eaten raw, cooked in pies and crumbles with apple, made into jam, in homemade wine, etc. A very versatile and tasty fruit. 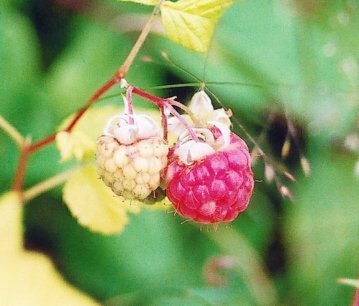 Common both as a wild plant and as an escapee from gardens on waste ground and around woodlands, raspberries are one of the finest wild fruits you're ever going to find. They often have a more intense flavour than the bloated farmed berries, which they can replace in any recipes providing you can find enough of them. Typically ripe in June or July, but stragglers sometimes remain on the plants until August or September. Keep returning to the plants through the season, and make sure you look right under the leaves to find the succulent red fruit. The dewberry is a fine tasting fruit. You'll find it spreading along open ground, rapidly colonising railway embankments and the like. The only problem is that when the berries are ripe they're hard to pick in any quantity without squashing them, so I personally tend to eat them as I pick them. The berry itself looks very like a blackberry, but you rarely find them with as many drupelets (the individual berries) as you get on blackberries. The main difference in the berry is that it's somewhat powdery in appearance, having the same mustiness as you get on a grape or a plum. Some people reccomend cutting the berry on the stem and freezing it, to be used like a cherry in a drink. 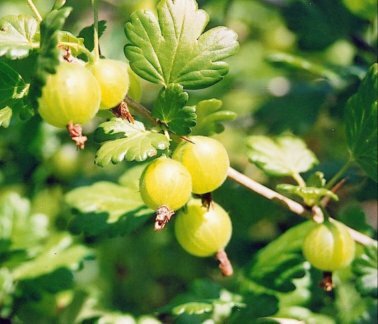 The wild-gooseberry is a relatively common inhabitant of our hedgerows and woodlands. 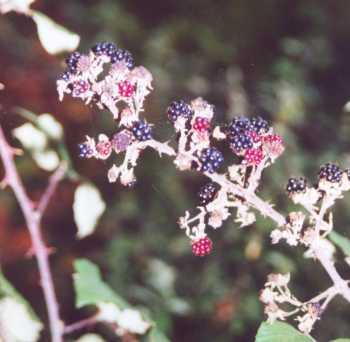 This specimen had the familiar green fruit, but wildlings with red or yellow berries can also be found. Use the fruit as you would it's domestic cousin, picking early for jam and later on for puddings. If you have them, wear a pair of stout gloves to ptotect yourself from the plants ferocious spines! A truly great way to use the wild gooseberry is in gooseberry and elderflower jam. 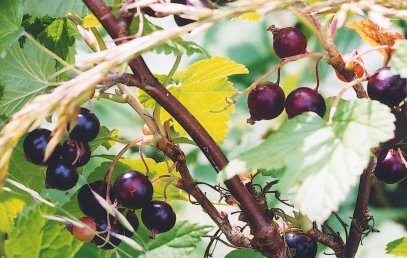 The familiar black currant fruits so profusely in some hedgerows that you can gather basket loads. A fine fruit to eat raw when ripe, but it's perhaps best used in jams, jellies and puddings. It freezes well for later use, and combines excellently with other berries in summer puddings. 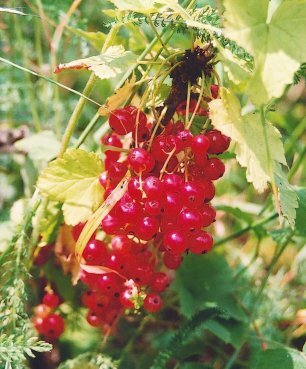 The wild red-currant is a tasty treat indeed. 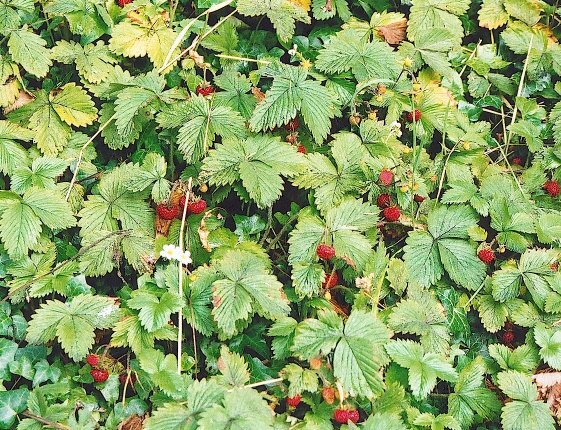 If you're lucky enough to find a big haul of them, they can be used in any recipes for cultivated berries. If you find only a few, then they make a fine addition to summer puddings or wild fruit salads. 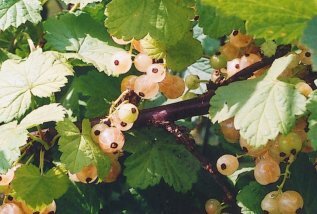 The white-currant (pictured below) is essentially a variety of the red-currant which you might occasionally run into. It's a beautiful looking berry, but the main difference between this and its red cousin is cosmetic. 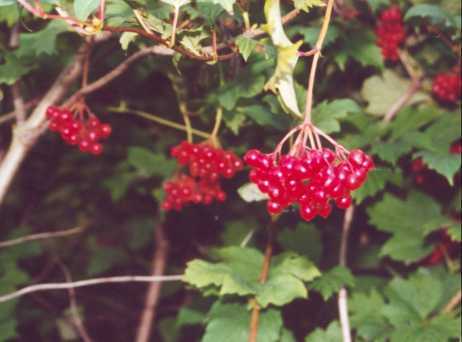 The beauriful red berries of the guelder rose look far better than they taste! This shrubby tree is common in the South of Britain, with bunches of white flowers standing out in the spring and early summer soon replaced by bright red clusters of berries that slowly weigh down their stork until they droop (as pictured above). I personally prefer to leave this one to the birds, but the berries can be used in the place of cranberries. Less tasty, perhaps, but they are packed full of vitamin C.
The fruit of the common dog rose, the rose hip, is a much under used entity. Cook it to a pulp with a little water, strain through a jelly bag, and cook with a pound of sugar per pint of liquid like you would for any fruit syrup and you have the legendary (to those brought up on tales of wartime austerity) rose hip syrup. 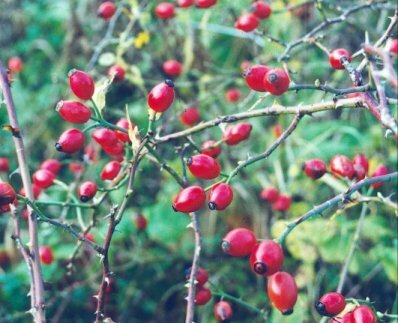 There are also a whole range of soups and wines that can be made from rose hips.